I seem to be collecting a lot of Martini liveries of late. Is it because I’m becoming an alkie or is it my appreciation for an eye catching livery that has been around for some considerable time now? 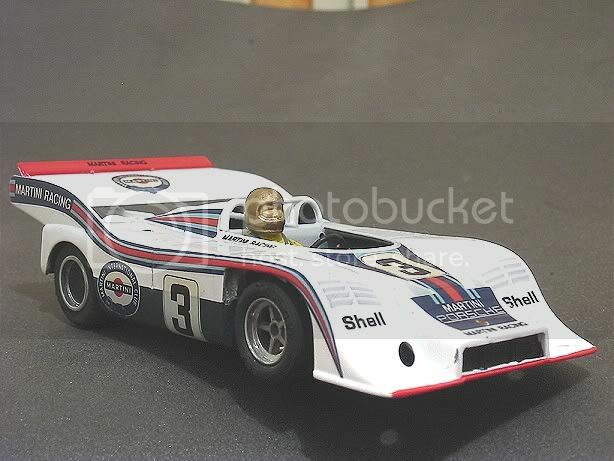 This model was supposed to be a replica of the Mark Donohue 917/10 and I had been tracking several over the months on ebay, most of which went for above my pre-imposed limit. This one then crept into my sights at the last minute and a tongue in cheek bid captured it. This is the AMT version of what must originally have been the Matchbox kit from the seventies. The sprues are marked ‘Made in England’ and the only difference I can see is that there is one anodised sprue which contains most of the suspension parts. I was initially surprised by the size of the model and wondered if it was true scale! Matching it alongside a Fly 917 showed it to be marginally bigger all round. 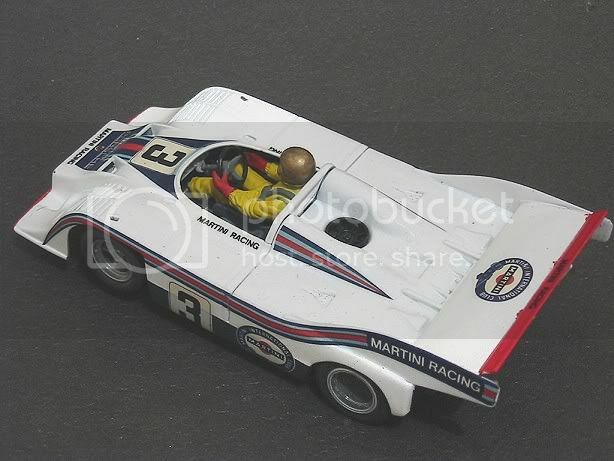 So, Martini it was to be and off we set to make a slot car from it. Most of the body parts were assembled as they were all to be the one colour, the chassis was marked out on a piece of copper sided PCB and the outline was marked and cut. 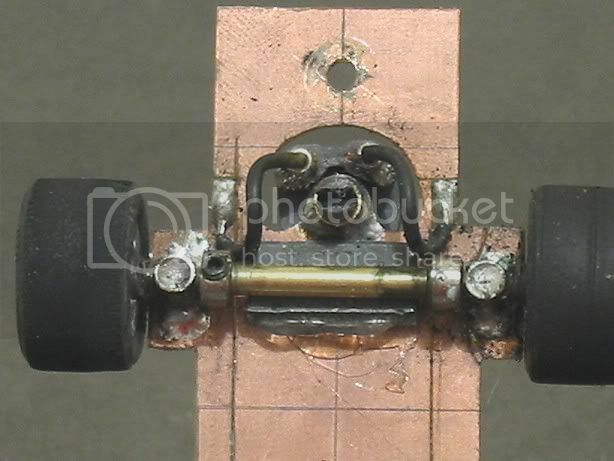 The chassis was then offered up to the body and the axle centres were marked on the copper side. The body was then mounted on a ‘lolly stick’ for painting and the chassis was completed. The wheels are anodised and are from the original kit with the addition of a reinforcing disc being glued in the back. The outer circumference had a narrow strip of plastic glued in place round the centre. This was to substitute the missing ridge which would be needed to hold the tyres on! Axles were cut from 3/32 music wire and fine trimmed to get the wheels as wide under the arches as possible. The front and rear axle mounts were cut from 3/32 i.d. brass tube and were mounted in a length of cross bored 3/16 o.d. tube. Both axles were then loose mounted onto the pcb in pre marked 3/16” holes. The guide is the trusty Ninco sprung guide. It has a bit more depth than most others and the spring feature allows a little leeway in axle height. The guide was mounted into a vertical brass tube which in turn was to be soldered onto the board. 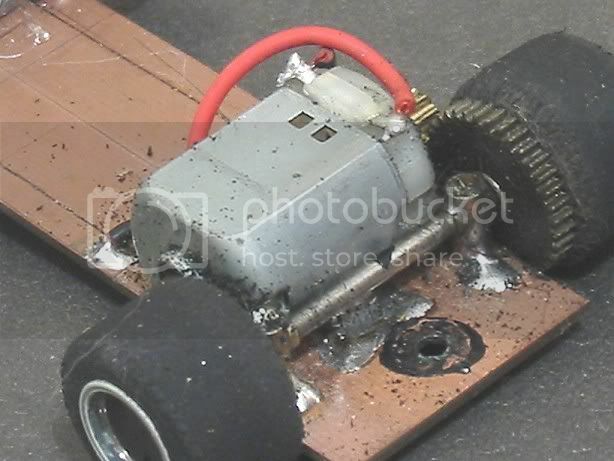 The motor is a Scalextric ‘S’ can which was also eventually soldered directly to the board. After all the vital components were attached loosely, the body mounts were cut from pcb mounting posts. These are a bakelite type material and have a brass thread insert in each end with a steel screw and lock washer. The posts were screwed to the chassis and the total depth measured for cutting. The posts were then cut a couple of millimetres short of the measurement. The cut ends of the posts were scored with a modelling knife and the position on the body underside was also scored. 24hour epoxy resin was then applied to both the posts and the body. The chassis was lowered into position and the whole was allowed to cure for twenty four hours. I went for only two posts as I intended to run with the fixing screws backed off slightly and allow the body to lift and roll onto its outside edge. The screw heads were ground to a steep tapered effect and the fixing holes in the pcb were countersunk to match. Once the chassis position in the body was set, the axle and guide tubes could be set and soldered in place to give minimal ground clearance. With these variables fixed the motor was mounted to the rear and soldered snugly against spur gear. Next operation on the chassis was the motor wiring. 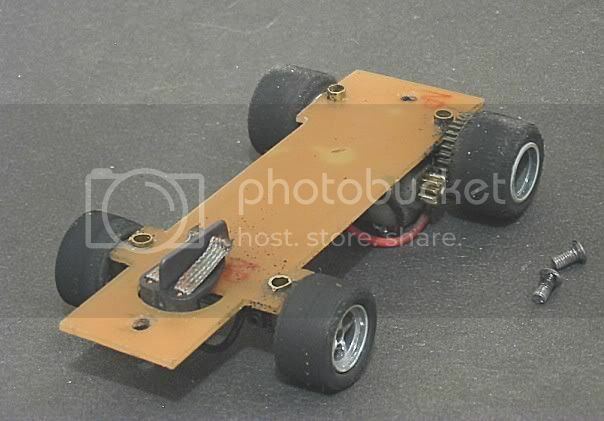 Because there is little clearance between the driver’s tray and the chassis I decided to make use of the copper board by scoring two strips in the copper. One each side. The motor was wired to the rear of these scores and the guide was soldered to the front. This had a second benefit of giving the guide a strong self centring action. Last operation was to convert the front axle to a ‘Wixle’ configuration giving a solid axle feel with independently rotating wheels. The rear tyres are the Scalextric micro foam F1 ‘Goodyear Eagle’ tyres, these have very good characteristics on timber and plastic. The front tyres are SCX type six. These were profiled on a dummy hub in a drill to give a slightly cambered tread area, minimising track contact to a couple of millimetres in the centre. The chassis was tested and the various bits oiled and bedded in. The finished chassis was very promising and didn’t display any bad habits. This was to alter slightly once tested with the body in situ. The body had a coat of flat grey acrylic (Tamiya neutral grey) applied to show up any blemishes or faults. The driver too was assembled and sprayed grey. The dimples and marks on the body were filled and smoothed with 600 wet and dry and lightly sprayed with the grey. Once happy with this, a coat of gloss white was applied to all body surfaces. The driver was placed on a ‘fly paper’ stick. This is a narrow piece of MDF which has had masking tape wound round it in reverse to show the sticky side out. 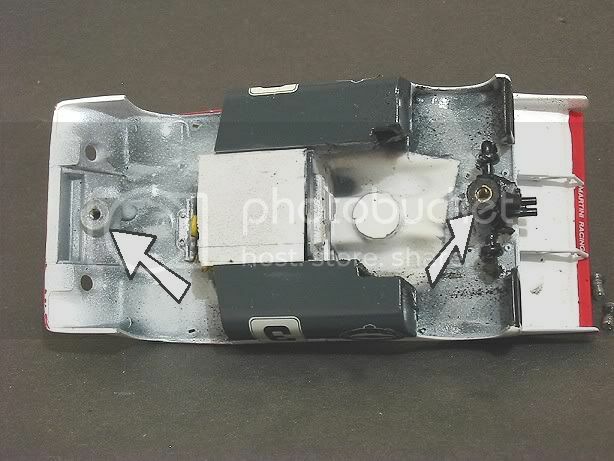 The driver and other small parts are stuck to this and their painting can be completed without getting it over your fingers or other parts. The decals were cut and applied to the body one side, one day at a time. This was to reduce the risk of disturbing wet decals whilst working in other places. Once all the decals had been applied and allowed to dry for at least forty eight hours, a light coat of thinned acrylic clear was applied to the whole model. This too was allowed to dry for a couple of days before handling the body. When dry, the satin black enamel was applied to the rear guards and other underbody parts. During this time the driver’s seat and the spare seat were mounted on a cut to size piece of thin plastic and painted. The finished driver figure was then glued to his seat and offered up into the model. The arms were glued on and put in place beside the steering wheel. The rear view mirrors were painted but these were not glued as they are totally vulnerable. They are detachable and will only be put on the model in times of rest! Once all was dry, the body was mounted to the chassis and a few laps were carried out to determine were all the rubbing spots were. This helps get as tight a tolerance as required. The inner wheel arches were scraped with a modeller’s blade where the tyres touched and the chassis was filed to get a smooth rocking motion without catching. A few more laps and in the box ready for its board track outing! Down at the local during a break in the evenings racing I got the 917 out and placed it on the track. Using the standard 45 ohm controller I set off quite quickly for its inaugural run. Mmmmm ! Very pleasant but not a rocket!? A couple of problems were immediately apparent. Firstly the tyres were still touching the insides of the wheel arches when the body tilted in the corners and secondly, the spur gear was perhaps too snug against the pinion. The wheel arch problem was solved by lightly sanding a radius on the outside edge of the tyres. This gave enough clearance to smooth out the cornering glitches. Next, the gears were cleaned and run dry for a while. These freed off appreciably but still needed a touch of the ‘Tamiya Fine’ polishing paste. Undaunted, I resumed the test and sure enough, the cornering was a lot smoother and the acceleration and straight line speed were markedly improved. Continuing for several minutes saw all the running parts loosen up and a fresh application of light oil to the axle bearings and spur soon saw the car running at a devastatingly quick pace. Only tenths slower than the best red lane tests to date. A little over two tenths slower than the Proslot GT2 Porsche and about a tenth slower than the Fly Lancia (See track time comparisons in this section). Not bad considering the spur still has a little bedding in to do and the other two cars have higher revving motors! The only other hiccup was once it found its new turn of speed it tended to lift out of the slot on full acceleration on the down hill sections of my local track. About 8 grams of lead was hot glued under the front axle and this appears to be the cure. I ran the car last weekend on a longer but more tortuous four lane board track where it showed itself to be more than able. The Scalextric Goodyear Eagles (yellow text, from Scalex world) seem to be very effective on painted board and with the tyres cleaned with WD40 it ranks amongst the quickest of my cars to date. I will be taking it on my next outing to my local track and will prepare myself to be surprised. Front axle width			61 m.m. Rear axle width	        		62.5 m.m. After having had this model for several years now and having a love hate relationship with it, I decided a few months ago to get it working once and for all. I had taken it to a couple of venues in the last year or two and raced it on the ragged edge and still only managed midfield results. Rather than give up on it I observed its performance at the Eggdome and realised the model was as quick as any round the bends but lacked that 'snap' when exiting bends and lacked a few r.p.m. down the straights. Back at the workshop I unsoldered the motor with the intention of stripping it and giving it a good clean out. This I did and the revs came up marginally but still fell short of some of my latest Scaley model motors. As it happened I had recently received a batch of five Scaley motors from Slotcars Wales to supplement my scratchbuild spares. I ran all five in and tested for the strongest motor. 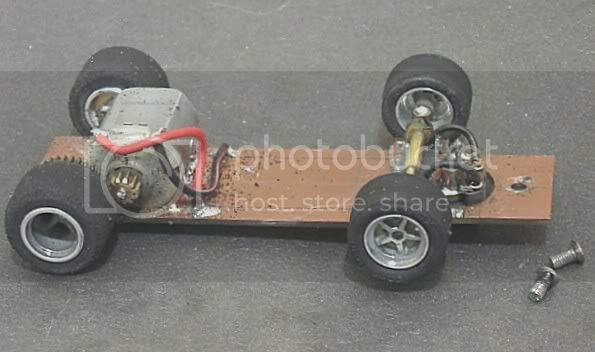 This was duly soldered in place replacing the old donk and after a few practice sessions it was a case of giving it some racing. This occurred last week when we had a non magnet event for Can Am cars with 18,000 rpm motors. In practice I was very comfortable with it and even managed to slip under the seven second barrier. Later in the race it was obvious the model had a new lease of life, and against some very quick Carrera and Fly models I managed to bring it home in first place twenty seconds or so in front of second place after twelve or so minutes racing. The only mods it has received since its initial build was the addition of a thin 5 gram square of lead directly under the centre of the model. It is still running the rubber Scaly F1 tyres (early) that were part of the original set up. A quick clean with Shellite (lighter fuel) before each heat and the magic was done. I also have a Fly 250 LM which was a bit off colour and this also responded to a motor transplant and is now a very quick front engined model. I was recently disallowed to race it in a classic Le Mans event on a large Carrera circuit because it wasn't a GT 40?? (I didn't read the invite properly). Had it been slower I'm sure the organisers would have ignored it. The lesson here is that Scaley motors do loose their zip and sometimes cars don't come with that zip in the first place! I am now converted and any 18,000 rpm models with 'S' cans which don't perform immediately get the transplant! At $40.00 for five including postage why would you do anything else?